This is SKYRACK Number 61, edited and published by Ron Bennett at 17 Newcastle Road, Wavertree, Liverpool 15 and dated 19th December 1963. 6d per copy. 2/6d for 6 issues. USA subscription rates are 35/ for 6 issues, or 70c for six issues sent airmail. 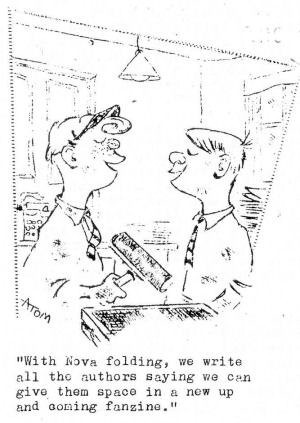 The heading, cartoon and interior illustration are by Britain's gift to the Trans-Atlantic Fund Fan Club, the originator of Atomania, Arthur Thomson. The pen picture is by Archie Mercer to whom all our thanks are due and contributions are by Keith Otter, Ted Carnell, Diane Goulding, Alan Dodd, Norman Shorrock and Colin Freeman. A MERRY XMAS & A HAPPY NEW YEAR to all fans! No fannish Xmas cards will be out from here. Instead, a donation has been made to Oxfam. May we suggest that you consider doing the same? At the first British world convention, in 1957, the attendees found themselves confronted with something hitherto unprecedented - a girl who was apparently able to go without sleep altogether for several nights on the trot and still look just as fresh as at the beginning. The girl in question was Jill Adams, a young housewife then living in east London, of which parts she is a native. Jill (or Gillian, to give it in full) continued to grace the fannish social life of the metropolis until husband John was transferred to Southampton and the family (including small daughter Penny) had perforce to leave the bright lights. Jill continued to come to every Con she could manage. She has had to miss approximately every other one, for various reasons - and she was also on hand as hostess for the notorious expedition that met Bruce Burn and his slate blue sausages when his boat docked from New Zealand in August 1960. It is ironic that at a time when I was thinking of introducing a monthly link between sf and news of the Big World Outside the world should be so devastated. The news of the demise of Nova Publications last month caused me to think that sf and fannish news is all too often presented in isolation when it could well be linked with news of the social progress(or lack of it) of the world at large. It would be worth mentioning, I felt, some of the events which have occurred in any one month in each issue of Skyrack. Three weeks ago, the President of the United States was assassinated. Humanity has been shocked and is speechless; the Press and commercial undertakings have speculated with shockingly raw vulturism. The heinous murder itself still cannot be fully realised; subsequent events have shown that we are, alas, still living in the world's middle ages. There is little pride in living in times like these. – RMB. THE CASTLE CON. Circulated with this issue of Skyrack is a flier containing information on next summer's Gerfan convention. Liverpool Group members are showing great interest in the intriguing prospects of a trip to this get together. Watch this space! SQUEAK 1 (Tony Glynn’s Xmas offering, 144 Beresford Street, Manchester 14; 4Opp) One of the more finely drawn pleasures of fandom is the active reappearance of a well-known name of bygone years, and if all re-appearances were of the calibre of the type indulged in by Tony Glynn, one-time Triode artist and convention regular, then the pleasure would certainly be intensified. From the 7th and 8th fandom days of fan-pubbing for the sheer hell of it comes this excellently produced publication from fandom's favourite western writer packed with the sheer pleasure of wild exaggeration. The whole zine is well written, well laid out and excellently illustrated. No sub rate is quoted, but I'm sure that Tony will let anyone not already on his mailing list to share the fun if he's asked. VECTOR 23 (Dec 63; the official organ of the BSFA, edited by Archie Mercer and published by J. Michael Rosenblum) This is a slim, 20 page Vector in keeping with the policy of regular publication but in all respects it is well up to the high standard of recent issues. Philip Harbottle writes in usual thorough manner on the development of the mutant in sf and there are the usual letters, departments and reviews. Vector is not available to non-BSFA members and it is only fair to point out that forthcoming issues of Vector promise an article on Edgar Rice Burroughs, Harry Harrison on Heinlein's Glory Road, Frank Russell on The Author's Lot and an original short-story by Ted Tubb. Also published by the BSFA is the Library Service Book List which was promised for some months ago. It is easy to see exactly why the publication of this listing has been delayed for several reasons. This is naturally a bulky listing and few efforts have been spared in its presentation, something most unusual in library listings. The duplication is first rate and there are short articles by Edmund Crispin and Brian Aldiss. Special mention must be made of the Eddie Jones cover illustration, which like its Vector counterpart, deserves unlimited praise. ZENITH 2 (Dec 63; published for the Birmingham SF Group by Peter R. Weston, 9 Porlock Crescent, Northfield, Birmingham 31. 38pp. 1/- per or 6 for 5/-). This really must be National Nostalgia Week, for it is just ten years ago that the Leeds SFA was publishing a wild fanzine called Orbit and if there has ever been a fanzine which "brings it all back," then, yes, it's the new Zenith (new, because many readers will readily think of the Harry Turner superzine of the same name). On the whole, Peter Weston and the Birmingham Group have learned several lessons which we in Leeds, and so many others before and since, have taken far longer to absorb. The layout, particularly in respect to illustrations, and the overall standard of duplication is most praiseworthy, but the writing is somewhat shallow and stilted, speaking in the most general terms. The promise is most certainly here and it is very obvious that there is little wrong with neo-fandom when new fanzines like this appear. It is practically impossible to list here all the items squashed into these 38 pages, but if there ever was an article to warrant a letter of comment from Norman Shorrock, then it is the one here on space slanted stamps! Possibly the most commendable feature of all is the practice of inserting pen-pictures of the writers; introductions of this type are to be encouraged. As is this new and bubbling group. POINT OF VIEW 2 (Dec 63; Charles Platt, 8 Sollershot West, Letchworth, Herts. 8vo; 34pp; 9d per, 2/6 for 4) Again a virtual newcomer to the field and a zine which is upholding its initial promise. (May I join Terry Jeeves in asking that the Xordvitch Learoyd series be discontinued fifthwith? This series is so far below your overall standard as to be unworthy of you.) Of outstanding merit in this issue is the evaluation of the present situation caused by the demise of Nova. John, Humphries, 42a Alfred Road, Birkenhead, Cheshire. Chris Miller, 5 Clitheroe Road, London SW 9. Jack Wilson, 45 Park Avenue, Spalding, Lincs. SKYRACK XMAS COMPETITION with apologies to Punch. You are invited to compile a list of useful phrases for extraterrestrials who are attending a BSFA Convention. Six phrases extracted from your listing, please. One prize, a year's subscription to Skyrack. Deadline for entries 31st January 1964. SNIPPETS: TAFF has kicked off its campaign between fan artist & Skyrack's choice Arthur Thomson and BSFA Chairman and Skyrack's other reader Phil Rogers. A tough decision and the promise of a riproaring campaign. Forms from Ethel Lindsay or Ron. Ellik ::: EFRussell's Call Him Dead bought for filming by Associated Producers and Clarke's A Fall of Moondust bought by Falcon, who plan to "go lavishly." ::: The deaths announced this past few weeks of Aldous Huxley, C.S. Lewis, Mark Clifton and elephant boy Sabu ::: Alan Dodd: Would you let your wife marry a Beatle? Colin Freeman: I wouldn't even let my Ant marry a Beatle! ::: 71b-15ozs Alastair Ross McAulay born in Co Dublin 28 October and immediately superceded as fandom's youngest on Merseyside as (promised headline) IT'S NAP ACCORDING TO SHORROCK! Gavin Quentin (Conan) Shorrock, 6lbs 13-ozs, born 11.30 am 22 Nov. Congratulations to all four parents and best wishes to Simone and Tony Walsh who are counting on an addition at any time ::: Diane Goulding birthday party, celebrated in two parts, the first in London 16 Nov by half of London fandom and the second in Liverpool 7 Dec with the visit of ex-Kingdon Road Alan Rispin, to Wavertree and Higher Bebington ::: SFCoL hosted by Ted Tubb recently to discuss formation of a new pro-Tubb religion! ::: Tony Walsh, 38 Saxon Rd., Bridgwater, Somerset invites 3 fans to join @ a mere 5/- preliminary registration fee, the forthcoming EasterCon in order to make up the round hundred ::: The same 100 fen might consider a little £300-per enterprise, too. With the by-passing of the new Commonwealth Cable a small Pacific island paradise (temperatures between 70 and 85, gentle rains, a shark-free lagoon, prim trees etc etc) is up for sale. The name? Fanning Island, of course.